If you’re a Blogger looking to increase your social media exposure, join this great cash giveaway event! 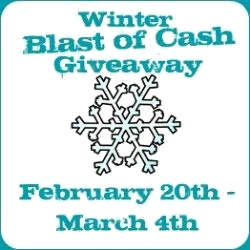 The Winter Blast of Cash will be held from February 20th-March 4th. This is a great and affordable way to increase your traffic and followers. Sign-ups are now open! Click HERE for more info. Please say that Twingle Mommy referred you!